These two bucks were taken almost 10 years apart in the same spot in southeastern Utah on public land. 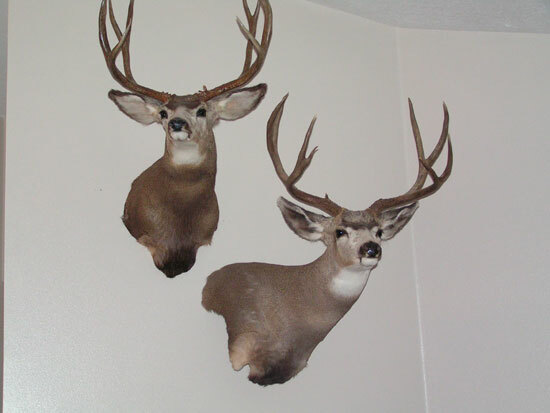 My older brother got the one on the left in 1995 this was his first buck, I got the one on the left in 2004. They share the same gene pool and we call them Grandpa and Grandson. Description: These two bucks were taken almost 10 years apart in the same spot in southeastern Utah on public land. My older brother got the one on the left in 1995 this was his first buck, I got the one on the left in 2004. They share the same gene pool and we call them Grandpa and Grandson. These two bucks were taken in the same are in Southeastern Utah. They were in the same canyon but were shot ten years apart. The buck on the left was taken by Wade Gardiner in 1995 when he was 16 years old, the one on the right was taken by Joel Gardiner in 2003.